After three days of virtually living in my car, I enjoyed a cup of hot coffee out on my own front stoop this morning. While I was outside ruminating about our road trip through West Virginia, my daughter Kendall wandered into the kitchen and made a healthy breakfast out of fresh peaches and oatmeal. We are home. Thankfully, we don’t have to go anywhere today except, maybe, the grocery store. I don’t think I could face another long day of driving. We started our day yesterday at my brother Matt’s house. Despite problems with his vehicle the previous night, he was cheery. In fact, his sunny, good time disposition is infectious. And he surprised us with a nice breakfast of fresh fruit and pastries. I probably should have taken a picture of what he laid out, because the internet doesn’t have enough pictures of food. But if it helps to visualize the scene in your head, we ate at the breakfast bar in his kitchen as his two dogs lounged at our feet. After breakfast, we drove to my brother’s shop in Hurricane—Bear Wood Company—to pick up the wedding gift my wife wanted us to fetch home. Then we backtracked to Charleston for a too-brief visit with my Mom. As we were making our way back to the interstate for the drive to the Northern Panhandle, I noticed a Tudor’s Biscuit World. After the breakfast my brother fed us, we weren’t really that hungry, but I couldn’t resist. The Eastern Panhandle is a Tudor’s-free zone. We have to make do with pale imitations. How could I not treat my daughter to her first Tudor’s biscuit? After all, the whole aim of our trip was to experience the things that make West Virginia tick. Am I right? To make up for my earlier thoughtlessness, we marked the moment with a pic. A few hours later, we found ourselves at the last stop on our itinerary, the Palace of Gold in Marshall County. It was a typically sticky West Virginia summer day, but the skies were blue and the breeze on the hilltop was mercifully cool. We spent some time wandering around the expansive compound, poking around the palace, stretching our legs by the pond, taking in the rose garden and marveling at the peacocks. The place is a transplanted slice of culture from the Indian subcontinent. We didn’t arrive back home in Martinsburg until well after dark. It was exactly 9:15 p.m. when I pulled into our garage, shut the car down and brought our West Virginia road trip to a close. In all, we visited the iconic Blackwater Falls, gazed across the mountains from giant boulders at Dolly Sods and unfortunately failed to hike Seneca Rocks as we had planned. We also spent a night in the Swiss village of Helvetia and visited the always impressive New River Gorge before driving to Logan County to find the final resting place of Devil Anse, the leader of the feuding Hatfield clan. And, of course, we spent some time with the always cheery Uncle Matt and my mom, before traveling to the Palace of Gold and checking off the last box on our list of places to visit. All in all, it was a good trip. A whirlwind, but a trip worth taking, if only to visit places we’ve never been before. I even taught Kendall how to use cruise control during a stretch when I worked up enough nerve to let her drive. As I mentioned in my first post, Kendall has her learner’s permit. She’ll be getting her actual driver’s license soon. And, before I know it, she’ll be taking road trips without me. In the meantime, however, she’s stuck with Dad and there are plenty more sights to see and things to do around the state. 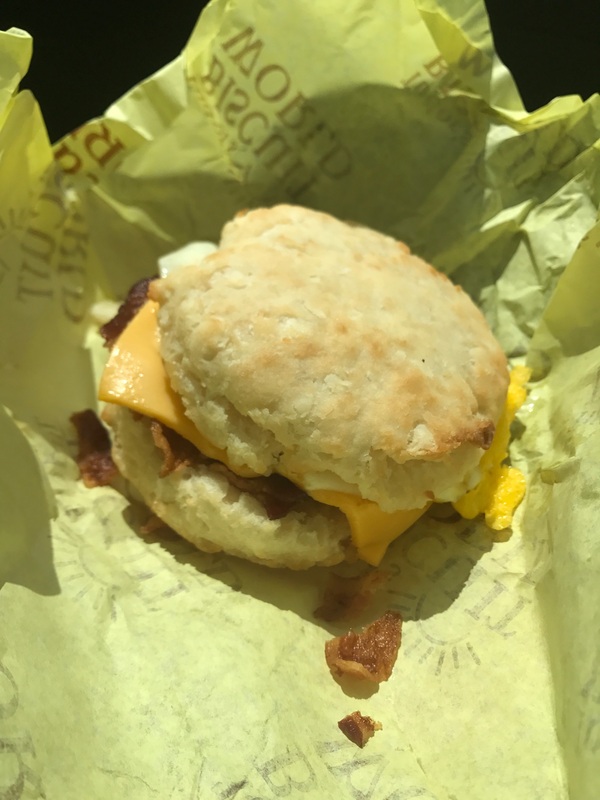 Thanks, Giles, for including Tudor’s Biscuit World in your travels & commentary. My husband and I met in Charleston. He is one of those rare “native” Floridians. I was born and raised in Cleveland, Ohio. We both love stopping at Tudor’s when we travel back to Charleston or through WV . Now my mouth is watering from your foodie shot! And I always think fondly of my time at WVaPR and working with you and the rest of the great folks there. Thanks for the memories! BTW, about 9 years ago my family, including my 75 year old Dad climbed to the top of Seneca Rocks. So beautiful! It rained on and off on the way up and down, cooling us off, refreshing us on that otherwise hot day. Hope you and your daughter get to go back. You’ll get extra cred with her if you let her drive.